Song of Increase, like my life, is all about bees. 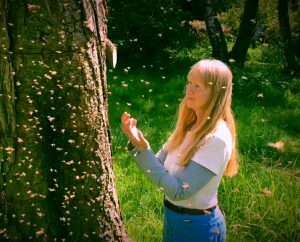 I show people how to gather and re-home swarms, rescue downed tree hives, help friends get started with bees, and I speak around the country at bee, nature, agricultural conferences, and book stores. My bee work has even taken me to Dominican Republic where I worked with rural beekeepers. I am immersed in the bee world. I speak bee. In Song of Increase, I write about my conversations with bees and the experience of building a deep relationship and learning from each other. 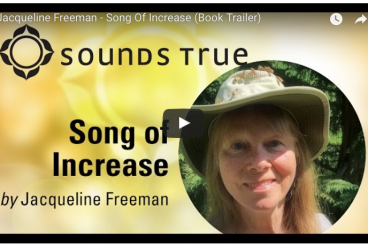 The Song of Increase book is not a “take all you can from a hive” beekeeping book. It’s about how to interact with bees (and all of Nature) in a respectful manner, how to understand subtle bee behavior and bee culture, and how best to support the colonies entrusted to your care so they thrive in their bee-ness. You will become a better keeper of bees through reading it. I like to think this behavior also makes us better human beings, too, more caring stewards of the world. How wonderful that is! Click on the image above to read an excerpt from Jacqueline’s Song of Increase book. In my book, I write about my conversations with bees and the experience of building a deep relationship and learning from each other. 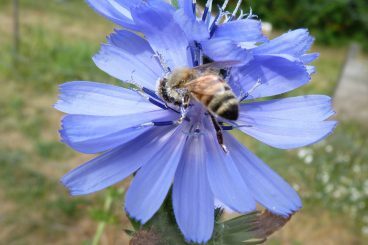 Our blog gives you gems about beekeeping from a "Bee-centric" point of view.